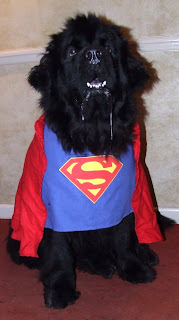 So it's that time of year again that I make Lola's outfit for the dog training Christmas Party, fancy dress contest.. the theme this year is 'Action and Adventure' so I'm leaning towards Superman, or I guess Supergirl! But any ideas would be gratefully received! I've got a great reputation to hold up... We're undefeated for about the last 9 or 10 years!! Went to the range today and picked up some fantastic long canvasses (or tall!) which I can't wait to get started on! 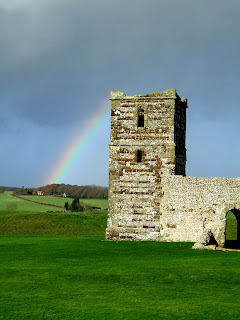 Also had a lovely walk between rain showers up at Knowlton Church - managed to get this fantastic shot of a rainbow! Check out that severe looking sky! Check out my snazzy pink colour scheme!!! Thought I'd start my New Years Resolution early and update things here before I 'TRY' to post everyday!!! I think i've finally gotten over the Cyber Crop! I managed 16 pages during a fantastic weekend and various other yummy bits and pieces! I was also so lucky to receive a couple of prizes! Lovely 7 Gypsies and Cosmo Cricket goodies are now just begging to be used!! This page was done for the pre-crop 'Hidden Secrets' Challenge.. shown both hidden and exposed!